But the recall doesn't automatically force Zuma out of office — he has to resign on his own, or the nation's Parliament must vote to remove him. The South African ruling party confirmed it has recalled President Jacob Zuma. The African National Congress released a statement Tuesday after holding a special meeting. But that doesn't force him out of office right away. Zuma has to resign on his own, or the nation's Parliament must vote to remove him. Zuma reportedly agreed to step down, but "only in the next three to six months," an ANC official told the BBC. Although it didn't give Zuma a deadline to leave office, the National Executive Committee of the ANC said in a statement that it doesn't agree with that time frame. The ANC voted to replace Zuma back in December. That's because Zuma has faced years of corruption allegations, though he's never been convicted. 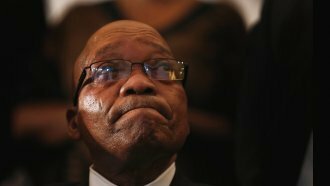 Zuma's second and final term as president was set to expire next year.